When you buy a plugin from Barn2 Media, you receive a license key which allows you to activate the plugin and receive ongoing plugin updates and support. Your license key is valid for 12 months at a time. It will be auto-renewed each year, unless you choose to cancel your subscription. What happens if my license key has expired? If you cancel your subscription and do not renew manually, then your license key will expire at the end of the 12-month period. You can’t activate your license key on new sites or domains. The ‘Download’ link on your Account page will disappear. You will stop receiving access to new versions of the plugin. We regularly release new versions to ensure ongoing compatibility with new versions of WordPress (plus WooCommerce if applicable); fix bugs; and add new features that our customers have requested. You will no longer have access to technical support with the plugin. What happens if my license key is invalid? 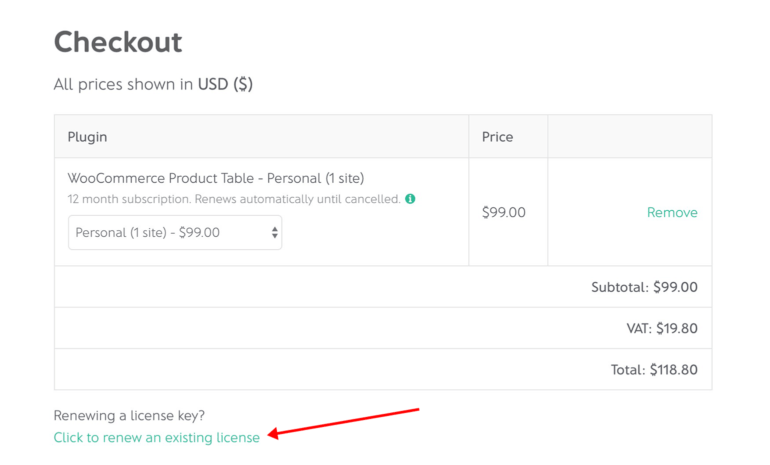 If your license key is invalid, then you will see an error next to the license key box on the plugin settings page. It means that your license key is not active on your website, so you will not be able to start using the plugin or access plugin updates. To fix this, please see our article on license key problems. How can I reactivate my expired license key? From your Account page. Log into your Account, go to the ‘Subscriptions’ tab, and click on the ‘Renew’ link. From the Checkout. Find the plugin and click the Purchase button. On the Checkout, you will see a ‘Click here to renew an existing license’ link. Click here, paste your expired (or soon-to-expire) license key, and click ‘APPLY LICENSE RENEWAL’. You can then complete the purchase to renew your existing license key. If you prefer, then you can buy the plugin as a new purchase. This will generate a new license key, so don’t forget to activate it on the plugin settings page. If I renew, do I need to re-install the plugin? No, you do not need to set up the plugin again. It will continue working as before after you renew your license key. If you reactive an existing license key then it will continue working straight away. You will start seeing plugin updates available to install under Dashboard -> Updates. If you purchase a new license key then you will need to re-enter the license key onto the plugin settings page in order to start receiving updates again.